If you are looking to do DIY carpet cleaning, this article has a lot of info on carpet cleaning and what you should or shouldn’t use in your carpet. If you have pets, you absolutely do not want to use vinegar! It’s inevitable; stuff spills or you track in mud by mistake on a rainy afternoon. When this happens at your house, don’t get mad (well, maybe just a little bit) or run to the store for expensive cleaning concoctions. Simply become a carpet cleaner mixologist and open your pantry. 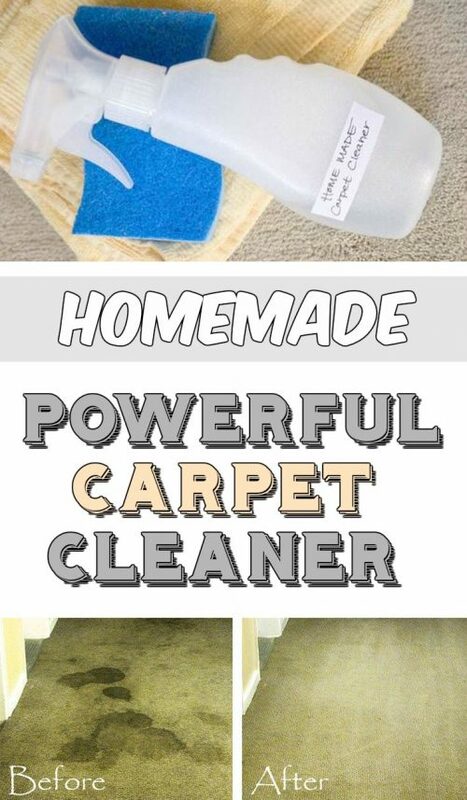 Not only does this homemade carpet cleaner cost pennies to make, but also, it does wonders spot-cleaning furniture, erasing stains from rugs, and touching up soiled drapes. Not all carpets are the same, so make sure to do a small spot check before tackling big stains. clean absorbent towel and a clean sponge. Mix all ingredients and pour the resulted liquid in a small spray bottle. Your homemade carpet cleaner is now ready to use!